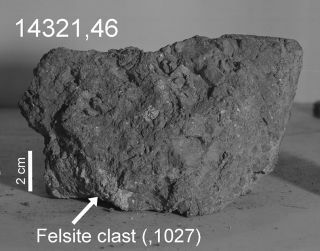 A moon rock brought back by Apollo 14 astronauts in 1971 may contain a tiny piece of the ancient Earth (the "felsite clast" identified by the arrow). A chunk of material brought back from the lunar surface by Apollo astronauts in 1971 harbors a tiny piece of Earth, a new study suggests. The Earth fragment was likely blasted off our planet by a powerful impact about 4 billion years ago, according to the new research. The research team — led by Jeremy Bellucci, of the Swedish Museum of Natural History, and Alexander Nemchin, of the Swedish Museum and Curtin University in Australia — analyzed lunar samples collected by members of the Apollo 14 mission, which explored the lunar surface for a few days in early February 1971. The scientists found that one rock contained a 0.08-ounce (2 grams) fragment composed of quartz, feldspar and zircon, all of which are rare on the moon but common here on Earth. Chemical analyses indicated that the fragment crystallized in an oxidized environment, at temperatures consistent with those found in the near subsurface of the early Earth, study team members said. An artist's illustration of the Hadean Earth, when the rock fragment was formed. Impact craters, some flooded by shallow seas, cover large swaths of the Earth's surface. The excavation of those craters ejected rocky debris, some of which hit the moon. The available evidence suggests that the fragment crystallized 4.1 billion to 4 billion years ago about 12 miles (20 kilometers) beneath Earth's surface, then was launched into space by a powerful impact shortly thereafter. The voyaging Earth rock soon made its way to the moon, which was then about three times closer to our planet than it is today. (The moon is still retreating from us, at a rate of about 1.5 inches, or 3.8 centimeters, per year.) The fragment endured further trauma on the lunar surface. It was partially melted, and probably buried, by an impact about 3.9 billion years ago, then excavated by yet another impact 26 million years ago, the researchers said. This photo by NASA's Lunar Reconnaissance Orbiter shows the Apollo 14 landing site and nearby Cone Crater. The trail followed by the Apollo 14 astronauts can be seen. Image width is 1 mile (1.6 kilometers). An Earth origin for the ancient fragment isn't a slam dunk, study team members stressed. However, it is the simplest explanation; a lunar birth would require a rethink of the conditions present in the moon's interior long ago, the researchers said. The new study was published online Thursday (Jan. 24) in the journal Earth and Planetary Science Letters.